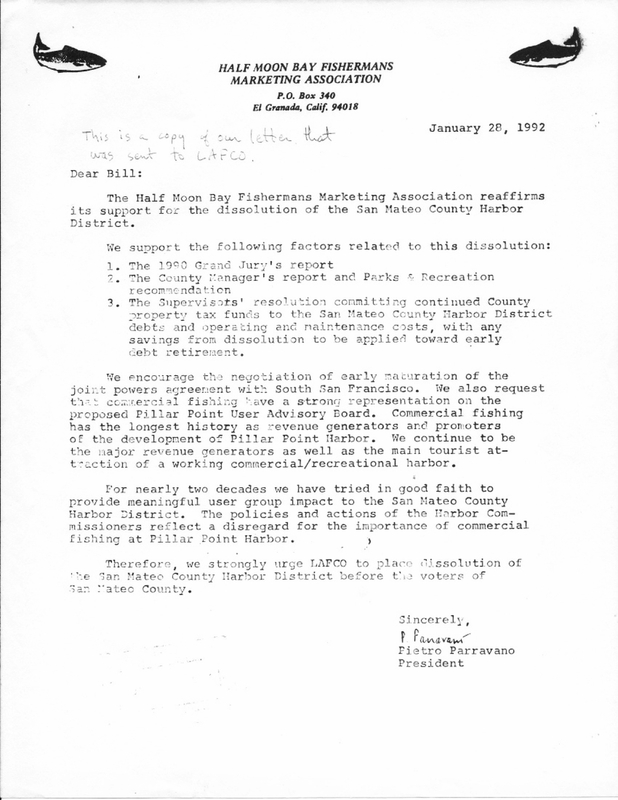 In 1992, Pietro Parravano, President of the Half Moon Bay Fisherman's Marketing Association, mailed a letter to LAFCo requesting dissolution of the San Mateo County Harbor District. In 1998 SMC Harbor Commissioner Don Shearer, who served with Pietro Parravano as Vice President of the HMB Fisherman's Marketing Association, pleaded guilty for embezzlement. It was reported in the San Francisco Chronicle that President Parravano gave Don Shearer the stack of blank checks Shearer used for embezzling money from the HMB Fisherman's Marketing Association and the Pacific Coast Federation of Fishermen's Associations. In 2012 Pietro Parravano's attempt at grant fraud from Bay Area Air Quality Management District was reported in the Half Moon Bay Review. A whistle-blower triggered an investigation by the Air Quality District and the $83,000. Carl Moyer Air Quality Grant from the state was rescinded.